And here she is, in all of her glory. We've been hearing plenty about the Lumia 1020 in the lead up to this event, and now, after a proper on-stage unveiling, we've finally got our hands on one. Granted, it's not the eye-popping yellow version Elop showed off on-stage (we got to play with the white and black versions), but it'll do nicely. As expected, the hardware's a beauty on this thing. There's that slick unibody design we've come to expect from recent Lumia devices, and in spite of amped up optics, the company hasn't really done too much to sacrifice weight and profile. On the front is an eye-catching 4.5-inch AMOLED PureMotion HD+, 1,280 x 768-pixel display, which nicely complements Windows Phone 8's bright UI. Nokia's also promised that the Gorilla Glass 3 display works well with gloves and is still readable in sunlight, but we'll have to get back to you on both of those. Remember that thing we said about the slim profile? Well there's one important, but understandable caveat to that. The lens juts out a bit on the back of the thing, so if you try to lay it on that side, it won't sit flatly -- but as Elop said, the back is the new front, so maybe rest it on that shiny display, we guess... About a third of the back side is monopolized by that big lens. Along the top, you'll see a large flash along with three buttons -- one for volume (for that amped up speaker Nokia's built in), one for power and one, naturally, for the camera. That, after all, is kind of the point here. 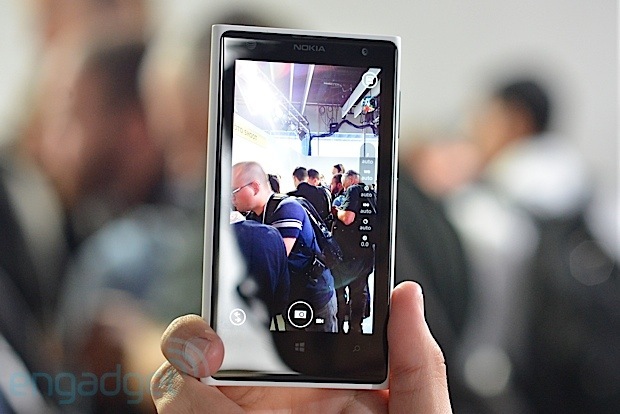 Check out all the news from today's Nokia event at our hub! Software-wise, you're talking mostly standard Windows Phone 8 fare, though if you're mostly interested in the photo aspect (as many surely are), the camera button will take you exactly where you want to go. As Elop said, it works right out of the box, and certainly we found that to be the case. Take a shot and zoom in and out to reframe it after the fact. Photos may take a bit longer to show up than on other devices, since it's making a 5MP copy at the same time, for all that WP8 social sharing you plan on doing. If you want to fiddle with the settings, as you no doubt do, a button will bring you to different apps that play nicely with the new camera, including Bing Vision, Panorama, Photosynth, Vyclone and Nokia Pro Camera. Naturally, we started with the latter, which offers up instantaneous changes to settings like the white balance, ISO and exposure. It's simple to use, and photo pros are no doubt going to want to spend a lot of time in there. Now, about that optional camera grip. Think of it like a Mophie Juicepack mixed with, well, a grip and a shutter button. The phone slides in from the top and locks in with a micro-USB connector at the bottom. On the exterior, you'll find a tripod thread along the side, while the bottom houses a micro-USB input for charging the battery packed inside -- four LEDs are onboard to check the charge level at the touch of a button. The shutter button thankfully has a nice and tactile click, with a pleasing amount of tension between a half and full push. Lastly, a strip of rubber for your fingertips adds to the secure feel of of its matte finish. Sure, it's a bit bulky, but we'll bet some folks won't mind. Edgar Alvarez and Joe Pollicino contributed to this report.